UC Santa Cruz assistant dean of the arts Keith Muscutt reported the existence of a previously unknown pre-Columbian ruin in Peru at the annual Institute of Andean Studies conference held at UC Berkeley last week. Located in the remote and densely forested eastern slope of the Andes Mountains, the massive ruin is thought to be a remnant from Peru's vanished Chachapoya people, who flourished in the upper Amazon region from the ninth to the 15th century. There is little evidence of the culture left today, except for the ruins of ancient settlements and well-preserved mummies recovered from cliff tombs. 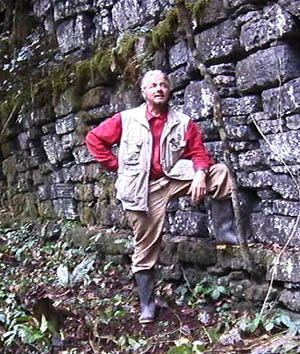 The ruin was first discovered by three local Peruvians in August who relayed the information to Muscutt, an expert on the Chachapoya and author of the 1998 book Warriors of the Clouds: A Lost Civilization in the Upper Amazon of Peru (UNM Press). Muscutt traveled to Peru in late August to make a preliminary survey of the site, dubbed "Huaca La Penitenciaria" (The Penitentiary) because of its formidable appearance. The site consists of a large ceremonial platform overlooking a plaza and numerous rectangular and circular buildings, situated in an area that has been covered by forest for centuries. Muscutt noted that it is of particular interest because of its size, distinct design, and remote location. "This is an exciting development for Chachapoya archaeology," said Muscutt. "With the exception of the colossal retaining wall of the Chachapoya citadel, Kuelap, I can't think of a Chachapoya engineering project as ambitious as La Penitenciaria. Over 25,000 cubic yards of dressed stone and rubble were needed to build it....It promises to open a new chapter in the history of the Chachapoya." Muscutt said that he is currently working with GRB-TV and the Discovery Channel to plan a full-scale archaeological investigation of the newly discovered site. He added that the ruin will be featured in a Discovery Channel documentary series to be aired next year. Muscutt has been exploring the Chachapoya's ancient home in the remote upper Amazon region of Peru for the past three decades. In 2001, he was featured in a History Channel program titled Cliff Mummies of the Andes.